The Viscount 100 Prestige Digital Organ was purchased from the Golden Gate Piano and Organ Company in Burlingame in 2015. The instrument and chancel re-ordering was funded by generous donations from members of the All Saints' congregation. The organ was built in Italy by Viscount Organs. In 1959 Marcello Galanti founded Viscount International. In the 1980s electronic musical instruments were completely re-born thanks to the advent of digital technology. This created a new evolution of quality and performance which would include keyboards, pianos and even classical electric organs. 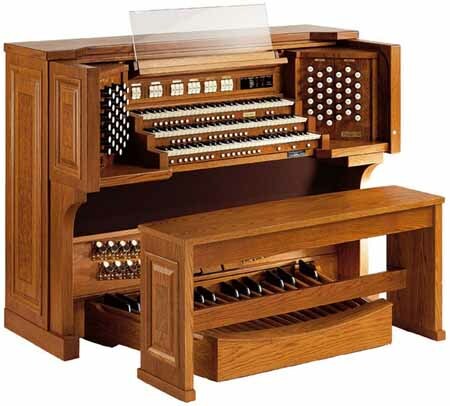 You can find out more about Viscount Organs and Golden Gate Piano and Organ Company by visiting our links page to be directed to their websites. In July 2015, All Saints' donated its old pipe organ to the monks at the Abbey of New Clairvaux in Vina.